In a recent blog post, I described my experience lecturing for Edinburgh Napier University. At the end of the post I shared a thought I had: field recording strengthens when recordists exchange ideas. I’ll explain more about that today. I’ll also offer one way to accomplish this. How can you do this? How can you find other field recordists, exchange ideas, and join a discussion? Well, it can be a bit tricky for a newbie to dip their toe in the pool of the sound community. Where do you start? Which Web site is best? Who are writing these posts? There’s a torrent of great information about field recording cascading through the Web. It’s hard to keep up. I follow dozens of sound blogs. I catch up on them all once or twice a month, usually while commuting. I took my first stab exploring the community myself in an earlier post. I’ve been pretty slack since then (I’ve finally gotten my Twitter and SoundCloud accounts in shape). So, today I want to expand on that. I created a field recording community list here on the site. I’ve stuck a link to the list in the toolbar. 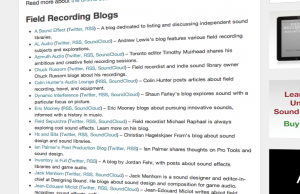 Field recording blogs (with some game audio blogs, too). Sound forums, meant for discussion. Sound group lists and clubs. Sound design and field recording news sites (and podcasts). Of course, there are lists and blogrolls elsewhere. A tally of field recording sites isn’t new. However, most of the time those are displayed simply, with site names and links. Some of them have strange names. It’s not easy to know the history, aim, and people behind each site. Each of these websites has a lot of personality. So, I included a brief description of what’s inside along with the site link. Also, I included three types of links to mesh you with the community more tightly: their Twitter account, the RSS feed, and their SoundCloud account. Browse the field recording community list. Wander into a new blog. Join a club. Sign up for a newsletter. There’s a chance I may have missed your blog. Maybe there is a favourite you’d like to add? Contact me, or comment below. Send me the links to the blog, RSS feed, and Twitter account, as well as a short description, and I’ll add it to the site. Why bother sharing ideas? What’s the point of drawing from, and contributing to the community? Surely you can just read a book? Perhaps it’s simpler to just borrow a few ideas from a forum and quickly apply them to your sessions? That’s true. That can get the job done. But sharing ideas about field recording has immense power. Why? The fact is that field recording is tricky to learn. It’s a relatively new activity. Recordists themselves are rare. We’re scattered, and rarely meet in person. It’s only infrequently taught in schools, and mentorships are next to non-existent. Because of this, a new field recordist’s experiences are scrawled on a blank page. They may ask: which field recorder should I buy? How do I scout? How do I record cats? How do I fix noisy recordings? These are important questions. Most of the time, however, recordists must explore and answer these questions alone. That means misunderstandings and errors are common. It can be frustrating. That’s understandable, especially with a lack of mentorship. Well, that’s not really efficient. Wouldn’t it be far better to build on experiences, instead of rediscovering them repeatedly? Imagine how much the craft would grow if experiences were added to existing chapters, instead of beginning writing on the first page. I don’t mean skipping fundamentals. Those must be learned. However it’s pointless for everyone to reinvent the craft every time it’s explored. It’s far better, now. You can search the Web and find dozens of articles about recording very tricky subjects, such as guns, or cars. So, fortunately, we’re not starting at the beginning. Just the same, I believe the craft has only begun being explored. Not even advanced field recordists know every trick. In fact, I believe we’ve barely finished writing the end of the first page. Ideas about the meaning of field recordings, emotional transference, the phenomenology of sound effects, their relation to place, as well as digital expression are only now being explored. The fact that we have access to any of this information is because ideas have been exchanged. There are many generous people who have devoted hours sharing their knowledge. It’s vital for everyone to do this. Why? It ensures that the knowledge about the craft expands. Knowledge about field recording can only refine further. This may come from a major shift in thinking. Perhaps it’s a smaller twist that affects only nature recordists. Any discussion improves the understanding of the craft, corrects each others’s missteps, and celebrates our successes. The point is that it tacks new knowledge onto the old, and grows the craft. There’s an added bonus: when information is shared, it eventually finds it way back to you. Others will benefit from your wisdom. Then, at some point, your craft will become enriched by another’s idea, perhaps built on one of your from years earlier. I want to emphasize that there isn’t a prerequisite to do this. Anyone can do it. It doesn’t matter how many years you’ve worked in sound, or what projects you have under your belt. You don’t need certain equipment brands. Some may suggest you need these things before your conversation has value. I disagree. It doesn’t matter how these ideas are expressed, whether through SoundCloud sets, a podcast, a blog, or a book you’ve published yourself. The truth is that any idea with integrity, no matter how small or new, is incredibly valuable. The most important thing is to contribute. Visit the field recording community list. 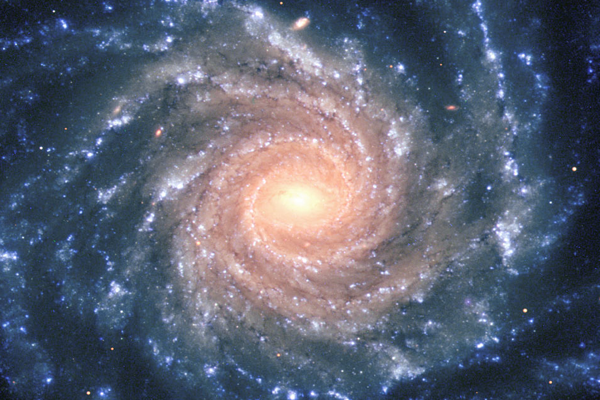 Images courtesy of ESO, and Creativity 103.